The first surprise of the day was the arrival of the furthest travelled participant, a gentleman from Trinidad no less! 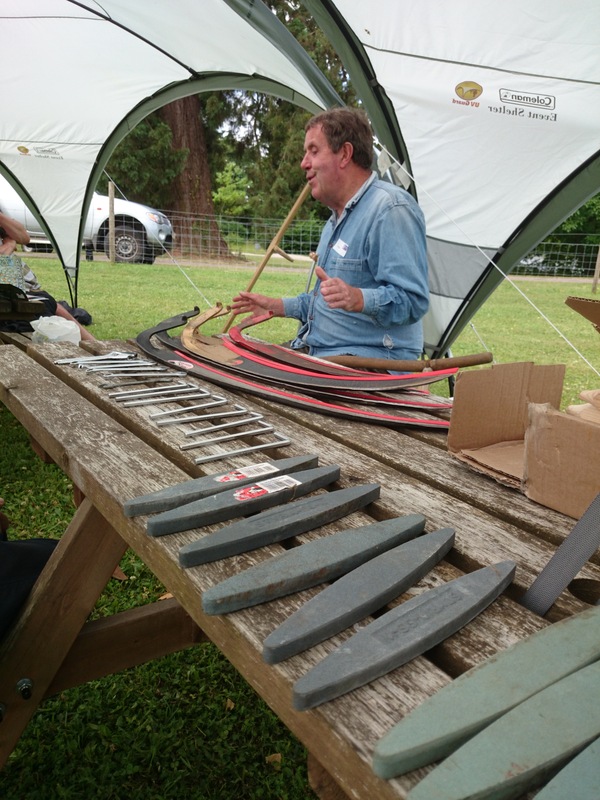 I expected to hear that his involvement was a tiny part of a European tour, but no, the scything workshop was the main focus of his trip – so is the draw of English scything! Other participants were drawn locally and from the South East, five candidates in particular aiming to use their new skill back in their workplace. As a beginner, my only experience of using a scythe was maybe 10 years ago now, when I attempted to sharpen an old sturdy scythe, taking it for a trial on a relatively small wild flower bank in Somerset. I quickly learned that technique was the key; something which I couldn’t fathom before I returned to using a brush-cutter. Now I won’t attempt to describe the practice of scything in detail, as it is much better to learn from a professional such as Clive, so instead of a step-by-step article, I’ve added a few facts below for information. 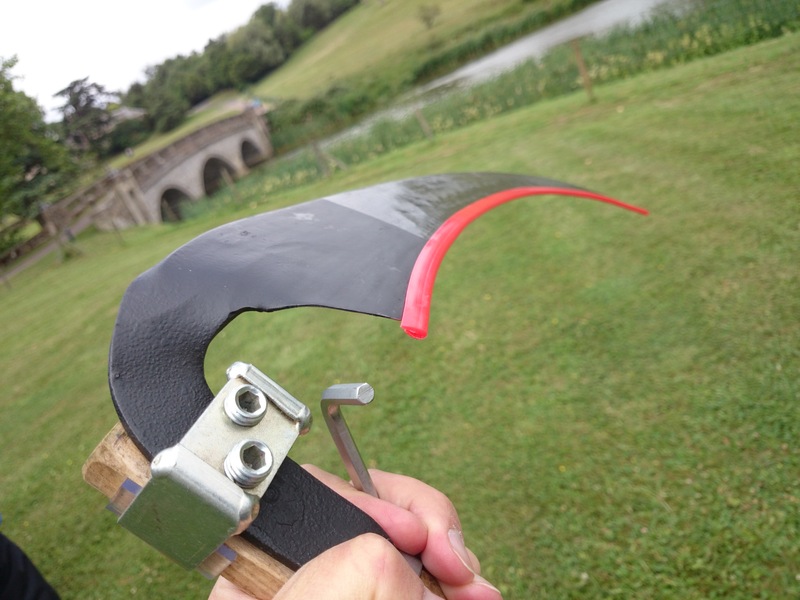 I will say however that I had high hopes for my introduction to scything, and I certainly wasn’t disappointed. The benefits of fuel-free grass and wild flower management should go without saying, but I was completely surprised not only at how easy and quick it is to scythe an area, but how completely effective it is compared to its adversary the strimmer. I’ve suspected this to be the case for some time, and whilst I can’t abandon the strimmer just yet, I was blown-away by the potential of the scythe and only wish I’d discovered it sooner! The handle, or long bent section we’re used to seeing is called a ‘snath’. However, scythe design and materials vary slightly around the world, with aluminium curved snaths favoured in North America and straight timber snaths with no top handle popular in Eastern Europe and Russia. The traditional scythe we’re mostly familiar with in the UK, often seen in museums with a heavily curved snath was (in the workshop) referred to as the ‘Old English’ scythe, and although effective if used correctly, is generally being superseded by a new ‘Austrian’ scythe, which was used exclusively in our workshop. Setting-up, adjusting and sharpening the scythe properly is very important both prior to use and constantly during cutting. Don’t be fooled by the simple look of the scythe, it’s a precision implement that is most effective if set and used properly. Technique, as I’m sure you’ll guess is everything. Slicing the grass (as opposed to chopping) is the method, moving forward, cutting from right to left in a sweeping, semi-circular movement. At least on grassland, this method was very effective, and with numerous participants, all working in tune with each other, much ground can be covered. 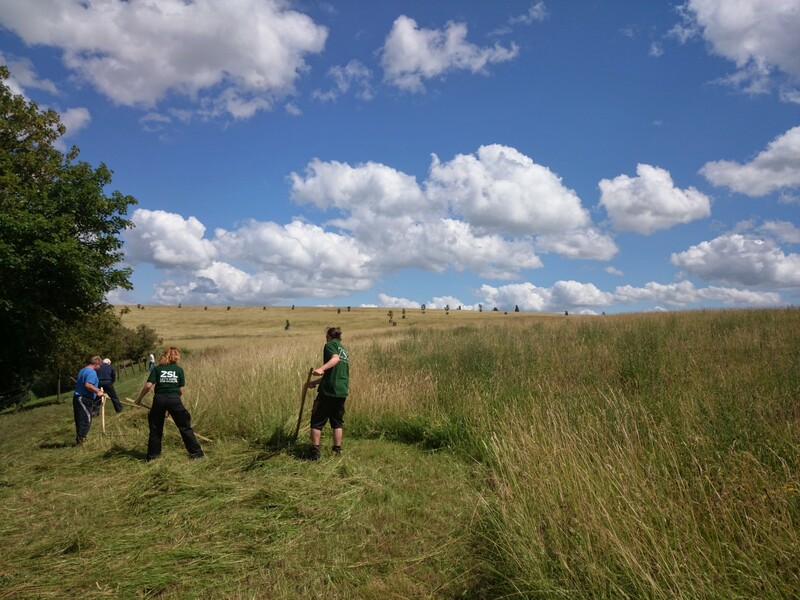 Under the close guidance of our tutor our team of six were smoothly (sort of) cutting a section of meadow within minutes, working in formation we swished from right to left, leaving a relatively tidy wind-row to the left side. Timing, choice of blade and style of cut have great effect. Damp grass it was suggested cuts cleaner than dry. Blades vary from longer, arching grass blades to shorter ‘ditching’ blades and bush blades with stone deflecting points for use on tougher, weedy growth. For all blades, it’s important to understand how to set the angle of the blade, make adjustments to the handle positions, and when appropriate use shorter cutting sweeps and so on. Sharpening, or honing the blade appears to be something of an art-form that needs some practice. Working in the field, sharpening can need repeating as often as every five to ten minutes, and a pouch is carried on the belt, filled with water and a wet stone for this. Over time, with repeated sharpening, the cutting end of the blade becomes thick and less effective, and so ‘peening’ becomes essential which effectively re-works the cutting edge of the blade, thinning the blade to form a new sharp edge – a simple task in experienced hands! 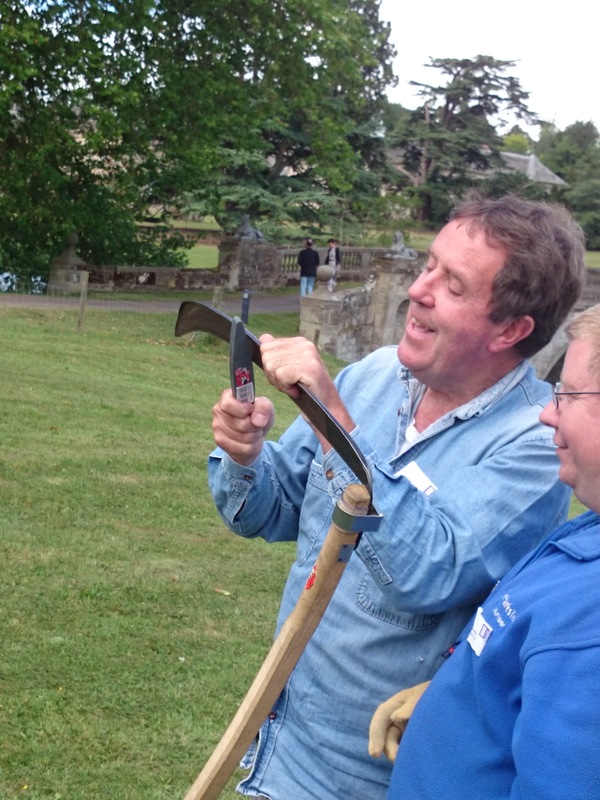 Now, apart from the technical aspects of scything, I did learn one extra interesting lesson. 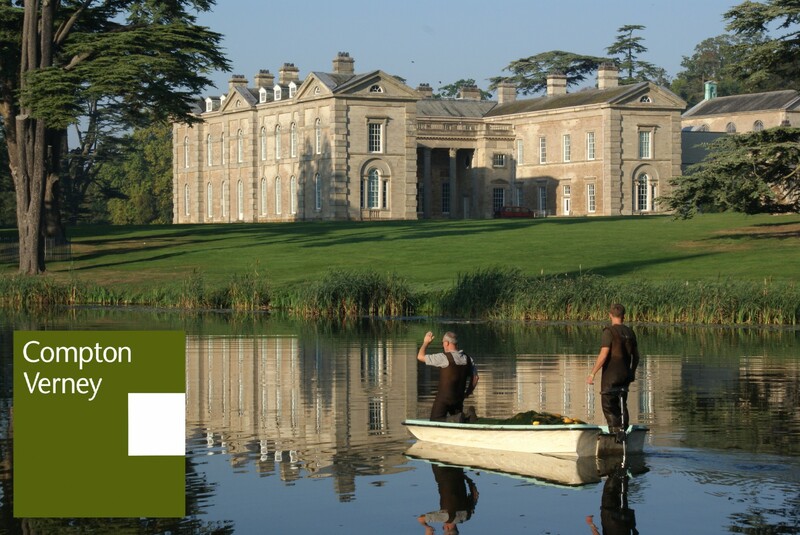 I now know that scything of a ‘Capability’ Brown lawn is not only achievable, but achievable to a good standard too. A good team of mowers, proficient with their scythes could indeed trim those smooth Brownian carpets, and I can’t wait to put my theory to the test with some lawn (as opposed to meadow) cutting trials! 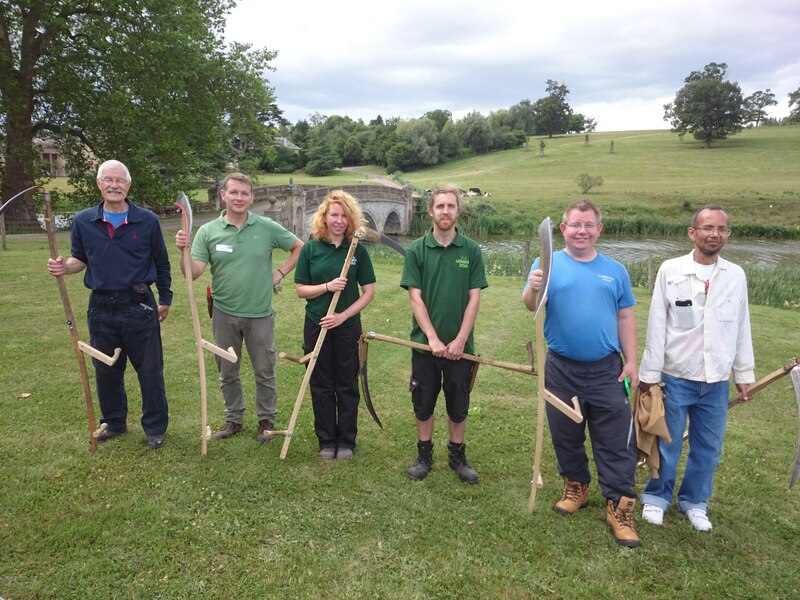 If you’d like to try scything, do keep an eye on our events programme for 2016, as I’d certainly like to see the workshop return to Compton Verney. You can come and do my wild flower meadow next – 5 acres worth ! Seriously a very interesting post . Grounds maintenance Teams in London Boroughs and zoos use scything; for more details contact Sue Clarke at Flora locale.